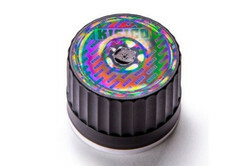 Closure specialist Kisico has launched a hologram-topped cap designed to protect against product counterfeiting. The design features a hologram that is fully integrated in the production process of the cap, so requires no additives, inks, or labels. The closure - dubbed the HologramCap - makes use of security technology developed by Morphotonix, a Swiss company best known for its brand protection technologies for metallic or plastic products. The style of the hologram can be individualized according to customer needs and can be applied to any existing cap says Kisico. When combined with a tamper-evident ring, the HologramCap "offers the most advanced protection for consumer and brand owner on the market," claims the company. The hologram is replicated in rigid plastic during injection moulding from standard steel tools. The extremely fine diffractive elements are nano-patterned with the proprietary Morphotonix technology directly on the mould, without modifying the equipment and with a guaranteed long lifetime during plastic production. "The ever-increasing number of counterfeited products forces brand owners to take action," says a recently-published Kisico white paper. "One of the greatest challenges for counterfeiters is to mimic the packaging, so that the consumers believe they are purchasing the original brand," it adds. Kisico is targeting the new cap at customers in the pharmaceutical, food and beverage industries, and gave a demonstration of the technology at the recent Pharmapack exhibition in Paris.